Could You Swap Your Therapist's Couch for Virtual Sessions? AS the World Suicide Prevention Day (WSPD) is being marked today, organised by the International Association for Suicide Prevention (IASP), and co-sponsored by World Health Organisation (WHO) and the World Federation for Mental Health (WFMH), Non-Governmental Organiaations (NGOs) as well as other stakeholders all should come together to raise public awareness that suicide is a major cause of premature death can be prevented. This is because an estimated one million people per year die as a result of suicide or about one person in 10,000 (1.4 per cent of all deaths), or "a death every 40 seconds or about 3,000 every day. 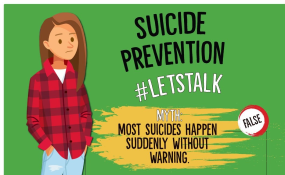 Still according to WHO there are 20 people who have a failed suicide attempt for every one that is successful, at a rate approximately one every three seconds, with further data showing that it is "most common cause of death amongst people aged 15 - 24. With the same data showing that more people die from suicide than from murder and war; it is the 13th leading cause of death worldwide, it is caused by a number of complex and interrelated and underlying factors, that can also contribute to the feelings of pain and hopelessness. Having access to means to kill oneself - most typically by firearms, medicines and poisons is a risk factor which the public should be made aware of that ending one's life does not necessarily mean solving the problem. With various events and activities being held for the occasion, the Media should be fully involved to raise the awareness as far as in remote parts of the country, not necessarily in institutions and urban areas where the problem can be recorded with ease. As of recent WHO released challenges represented by social stigma, the taboo to openly discuss suicide, and low availability of data are still to date obstacles leading to poor data quality for both suicide and suicide attempts: "given the sensitivity of suicide - and the illegality of suicidal behaviour in some countries - it is likely that under-reporting and misclassification are greater problems for suicide than for most other causes of death. Government agencies and individuals should fully rally behind the IASP and WHO to mark the day and enlighten the public as far as in remote parts of the globe that suicide is a cowardice way of solving an individual's problems, because at the end of the day all human being have problems and they make part and parcel of life.